Tom Green has followed God’s calling and is a youth minister in Cushing, Okla.
Green received his education in Winner and is the son of Jo Green, Winner and the late Dennis Green. 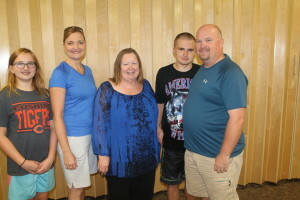 Sunday morning Green, his family and members of the youth group from the First Assembly of God church in Cushing were in Winner to have lunch at the Methodist Church. The group were on their way to Rapid City to spend a week doing mission work. There are 16 students on the trip. Green said they will talk to the Boys and Girls Club of Rapid City and one day will feed the homeless. They will clean up a park and do other service minded work. They group will stay at a church in Rapid City plus will take a trip to Mount Rushmore. Green explained for some of the kids this is their first trip outside of Oklahoma. A lunch of barbeques, pasta salad and fruit at the Methodist Church were enjoyed by the group. Tom Green is a 1990 graduate of Winner High School and a 1994 graduate of the University of South Dakota with a degree in music education. He was a substitute teacher in Minnesota and then worked for a seed company. The family moved to Colorado where he worked for Oppenheimer Funds for seven years. From Colorado, the family moved to Norfolk, Neb., where he became a deacon and a youth leader at an Assembly of God Church. Green started the school if ministry in Nebraska and got his credentials through the Assembly of God. “God gave me a call to start my schooling,” he said. Green is now working on getting his license to work in the church. He saw on a web site that the church in Cushing was looking for a youth minister. He accepted the call and has been there for one year. Cushing is located southwest of Tulsa and has a population of about 8,000. The oil pipeline is city’s largest employer. Green and his wife, Julie, have two children Kaleb and Jessica.